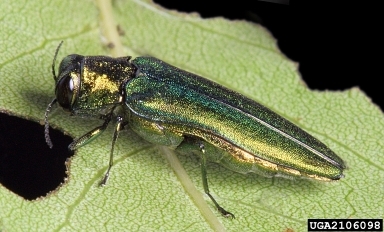 The Emerald Ash Borer (Agrilus planipennis) attacks ash trees when in the larval stage. Surveys are conducted because of the presence of potential host material in Wyoming and potential introduction pathways from surrounding states, possibly from the movement of firewood. It has been found in the north-central US. To date, the Emerald Ash Borer has not been found in Wyoming, however it as been found in Boulder, Colorado from 2013 to 2017. 1,446 individual ash trees have been surveyed in Wyoming. One thousand three hundred sixty-nine traps have been placed throughout twenty-three Wyoming counties. The Emerald Ash Borer Survey in Wyoming is accomplished by the USDA APHIS PPQ. Traps developed for Emerald Ash Borer surveys are hung in ash trees, usually in urban locations where the majority of ash trees are found in Wyoming.